Can I do a Split Screen View with the Internet as one of the screens? Great question! Yes, you can do this with Legacy. It sure makes it nice to be able to see both your Legacy data and the Internet at the same time. Follow these step-by-step instructions. With Legacy 6/7 open, click on the View menu, then click on Split Screen View. Click No. Two copies of your family file are now visible, side-by-side. On one of the sides, click on the Legacy Home tab. You can now browse the Internet on the right side. 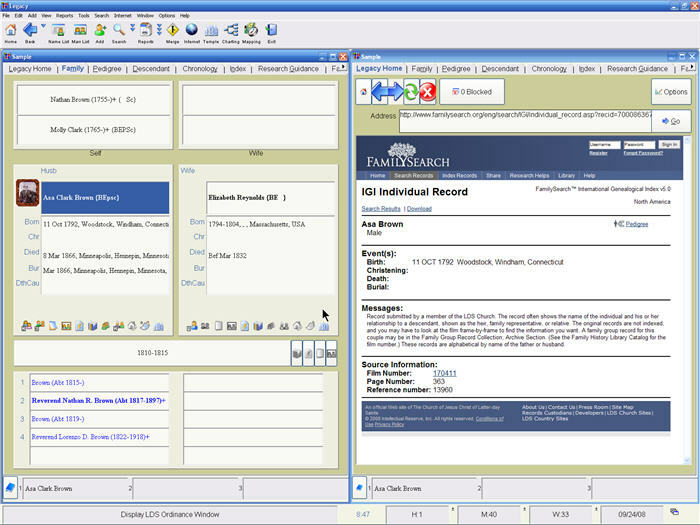 When you locate information, you can copy and paste it into your Legacy file on the left side. Even better, hook up two monitors to your computer. On the left monitor, have Legacy open. On the right monitor, have the Internet open. 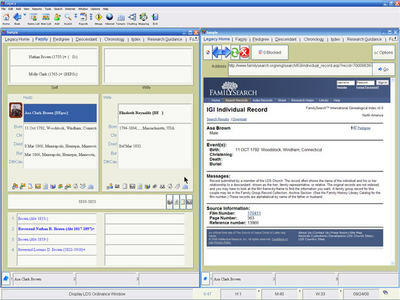 Or resize those windows to have your email software and your photo organizer software visible too! 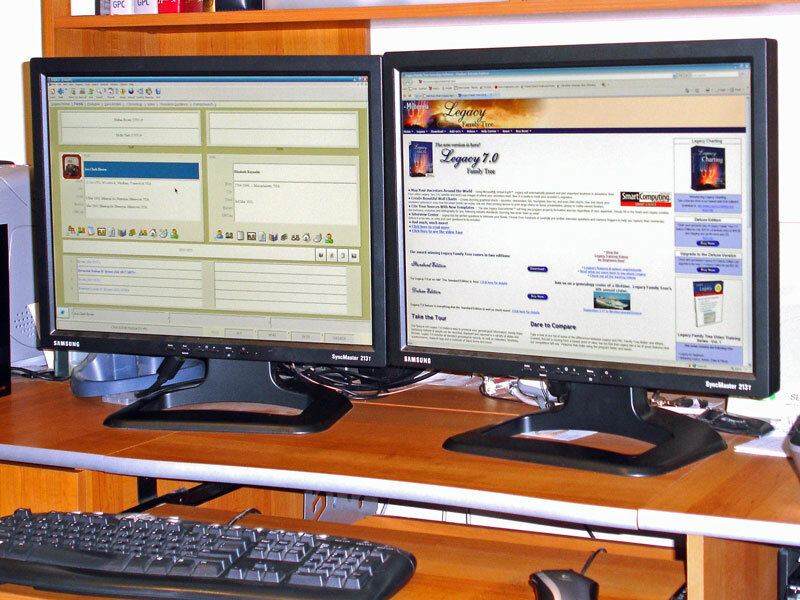 The two monitors behave as one large desktop so you can easily drag/drop/copy/paste information from one side to the other. (Writing this article forced me to finally clean up and dust my desk....) For more information about setting up two monitors for your computer, read our article here. If you have considered becoming a professional genealogist, or even if you want to enhance your research skills, you have a great opportunity to learn from experts at the 2008 ICAPGen conference held November 7-8, 2008 in Provo, Utah. The International Commission for the Accreditation of Professional Genealogists is an organization which sets standards for the genealogical community through comprehensive written and oral examinations. This year's conference features instructors from the BYU faculty, professional researchers, and other experts in genealogical and family history research. Each class has been chosen to provide advanced training for the genealogical researcher. You will be able to learn important techniques for research and writing. Those who would like to take the Accredited Genealogist examination can get answers to their questions and concerns. Professional researchers can learn ways to improve their business. Following is a list of the classes offered. Registration is required. For more information, visit http://icapgen.com/Programs/conference.htm. TORONTO, Sept. 16 /CNW/ - In a world first, Ancestry.ca, Canada's leading family history website, today launched online the Canadian Passenger Lists, 1865-1935, which contains more than 7.2 million names, including 5.6 million of those who travelled from around the world to start a new life in Canada. An estimated 11.6 million Canadians or 37 per cent of its current population have ancestors included in this collection(1), which also includes records for many vacationers and travellers, business people, crew members and historical figures such as foreign leaders, scientists and celebrities. Individual records include information such as the passenger's first and last name, estimated birth year, year of arrival, port of arrival and departure, ship name, occupation, final destination in Canada and other family members listed with their relationship indicated. Josh Hanna, Senior Vice President of Ancestry, International comments: "This is the first time that these important records have been brought together in one place online, making them accessible to so many; they will be of significance to literally millions of Canadians who want to know when their ancestors first came to Canada and how far they came." "Due to the internet, family history is a rapidly growing interest among Canadians and Ancestry.ca is proud to play an important role in preserving and making important Canadian historical records accessible online." Tommy Douglas - "The Greatest Canadian" arrived in St. John as an 11 year-old with his mother and sisters on the SS Scandinavian on 10 January 1919. Lord Stanley of Preston - The namesake of the Stanley Cup appears as 'Hon. A Stanley', arriving in Quebec on the SS Sarmatian on 13 August 1888, the year prior to being named Governor General of Canada. Richard Palamountain - The maternal grandfather of Donald S. Cherry, he was listed as 'R. Palamountain', arriving on a hospital ship called the SS Llandovery Castle in Halifax on 29 Sep 1917 suffering from Nephritis. He received a citation for his courageous efforts at the Battle of Vimy Ridge. Winston Churchill - The future British PM visited Canada with his son Randolph, brother John and his nephew, also John, arriving in Montreal aboard RMS The Empress of Australia on 9 August 1929. Charlie Chaplin - The famous star of the silent screen and one of the biggest celebrities of the era arrived in Vancouver onboard the Hikawa Maru on 13 June 1932 from Hong Kong via Yokohama. He lists his occupation as 'Actor' with an intended final destination of 'Hollywood, California'. John Turner - Following the tragic death of his father in England, the future Prime Minister immigrated to Halifax as a two year-old on HMS Montclare on 29 February 1932. Albert Grey, The 4th Earl of Grey - The former Governor General and namesake for the CFL's Grey Cup arrived in Quebec City on 21 July 1910. The record lists him as 'Earl Grey' with occupation listed as 'Governor General'. Juho Hyytiainen - A great-grandfather of Pamela Anderson, Juho first left Finland in 1908, changing his name to Anderson upon arrival onboard RMS The Andania in Quebec on 30 August 1913. He declared that he was a 'Labourer' and 'Single'. Canadians will also be interested in other famous names to appear in the collection including Alexander Graham Bell, Fred Varley, HG Wells, Stanley Baldwin, Prince Henry, Prince Pierre of Monaco and numerous other world leaders. The Canadian Passenger Lists, 1865-1935 will be available to Canada and World Deluxe members and through a 14-day free trial and can be viewed at www.ancestry.ca/CAPassengerLists. 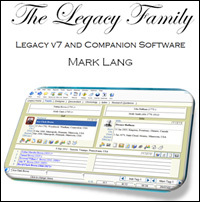 Hot on the tails of the release of Legacy 7 is the much anticipated publication of The Legacy Family by Legacy user/tester, Mark Lang. 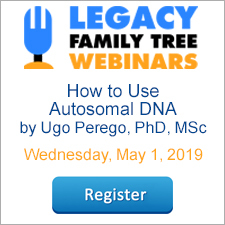 The Legacy Family delves into how to start your family tree using Legacy for the absolute beginner then quickly moves into how to customize the program to your own research needs. Then for those who are still weighing their options on whether Legacy 7 Deluxe is the right choice for them, Mark shows you all the ins and outs of all the new features - from the new Help system to Best Fit columns, from Standardization Tips and Privacy Settings to LDS Codes; all 23 features including the big guns – Charting, Mapping and the all new SourceWriter functions. There are three key chapters on how to search your data in your family file, how to effectively use sentence structures in Legacy, and everything you need to know about backing up your files for safety. In addition, Mark writes about creating web sites, including what not to do when creating such sites. He explains in detail how to actually publish your pages on the Internet. There is also pertinent information on how to share information with others, and what is actually needed when you want to move your Legacy data around from one computer to another. In the second part of The Legacy Family, Mark informs us all on all the different add-ons that are available to Legacy and how you can use this software to extend your family project. Each of these add-ons has its own chapter, highlighting each of their functions in detail. Each add-on shows by example how to incorporate their results into your family project. If you have ever wondered what a particular program does, or could do for you, then The Legacy Family is the book you need to answer all your questions and more. 495 pages, 24 chapters, 7 appendices plus an index, available now as a PDF download. To purchase for $24.95, click here. 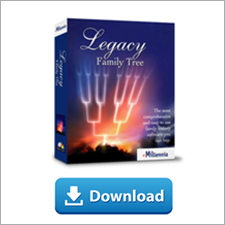 To download Legacy Family Tree 7.0 Standard Edition for free, click here. Legacy Family Tree 7.0 introduced the SourceWriter, a template driven sourcing system that makes it easy for you to select the correct input screen so that you enter all the pieces needed to correctly cite any source of information in the thousands of formats that exist for them. The information you enter is correctly and precisely formatted to match the genealogy industry standards for source citations. Here are a few tips to answer questions recently asked on our mailing list. 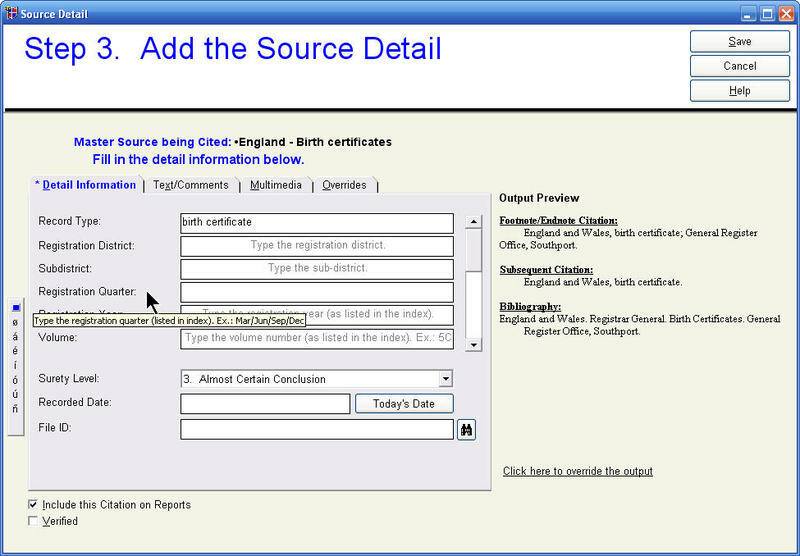 The image below (click for larger) shows the Source Detail screen for adding information about an England birth certificate. Notice that each field contains faint, light-grey text providing a tip for what should be entered in that field. For example, the Registration District field's tip says "Type the registration district." So here you would type the registration district. Did you notice that when you click in a field to start typing the information that the light-grey text disappears? This works as intended, but sometimes it would sure be nice to know what the text says, to remind you what you are supposed to type. The solution is simple. Just hover your cursor over the field name on the left and a yellow memo field will appear with the same instructions that are in the field. This is also helpful when there is not enough room on your screen to see all of the instructions. Family History Library microfilm. If you are using microfilm at the Family History Library or at one of its centers, the place to go to locate the NARA roll number is the Family History Library Catalog. 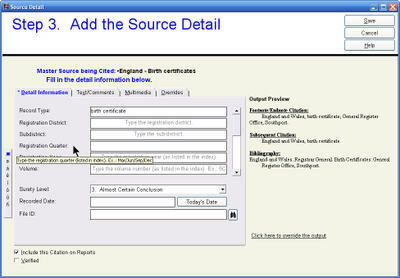 After locating the specific census in the catalog, click on the Film Notes button in the upper right. Click here for an example. In the notes section, both the series (T626) and the roll number are given. Online images. If you are looking at a digitized image at a site such as Ancestry.com, click on either the Back to Record link or the View Record link. The record contains all the "metadata" for the census image. In the Source Citation section, the roll number is the number following the underscore in the Roll section. Source Citation: Year: 1910; Census Place: Bisbee Ward 1, Cochise, Arizona; Roll: T624_38; Page: 3A; Enumeration District: 5; Image: 447. Steve Morse's Microfilm Roll Numbers for the 1790-1930 Census. Perhaps the easiest tool to locate NARA roll numbers for all U.S. census records is Steve Morse's site. Here, select the year, the state, the county, and type in the enumeration district number (located on the census record itself) and the site will then display the NARA roll number and the Family History Library's roll number. A recent update to Legacy added a new choice in the Source Type list. If, instead of using the SourceWriter to add a source, you want to use the basic-style source method, just click on the first choice, "Add a Basic Style source." This new option makes it simple to switch back and forth between styles. 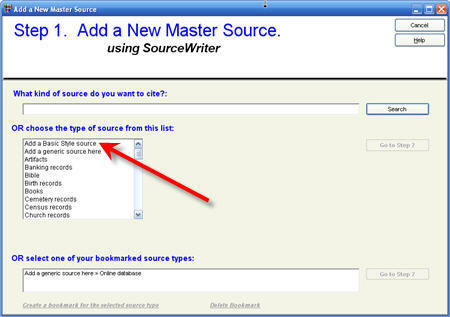 Of course, to use the SourceWriter, you need to have its option turned on at Options > Customize > Sources tab > Source Entry System. The SourceWriter can be very flexible. Just because a field is provided does not mean that you have to enter information in it. For example, the 1906 Western Canada census has a field for the name of the province. Entering the province here would help you follow the guidelines as presented in Evidence Explained, but it would also add more sources to your master source list. Leaving this field blank would allow you to have just one master source that can be used for all of Canada for this census year. You could enter the province as part of the city field of the Source Detail: "Raymond, Alberta" for example. In my personal correspondence with Elizabeth Shown Mills, author of Evidence Explained, she has used the term "the spirit of Evidence Explained," meaning that if we are consistent and trying to follow standards in our citations, we can be flexible with our use of the SourceWriter. Do you have an experience with the SourceWriter that you think would help others? Leave a comment below or send us an email. How often should you backup your computer? Before going to bed on Saturday night, I turned off my computer. I never turn off my computer at night - I want it to be ready for me in the morning. I do not want to wait for my email to download and other programs to start up. For some reason, I turned off my computer Saturday night. Sunday morning I pushed the power button. Nothing happened. It has been a while since I've actually pushed the power button to turn on my computer, but when the push of the button did not result in the computer turning on, I instantly panicked and thought, "when did I last back up my computer?" Fortunately I did have a backup of everything on an external hard drive, but it was about two months old. I've done a lot in the past two months. I took hundreds of digital pictures on our Legacy Cruise to Europe. I've added a few dozen new people to my personal Legacy file. And I've received thousands of emails. All of this would be lost if I had to revert to my most recent backup. It turns out that the power supply inside my computer failed. A new one only cost $39.95 to replace. But just imagine if something worse had happened and I lost two months of my history. The solution is pretty simple, and it just takes a few extra minutes to set up my backup software, Acronis True Image Home, to create an incremental backup every day. After backing up my entire computer to my external hard drive, each daily incremental backup will only backup those files that are new or have changed since the last incremental backup. This saves time when creating backups, and best of all, it can be completely automated. I have now set up the software to make an incremental backup every evening at 2AM (I'm usually asleep by then...). I still have not had a "computer crash", but when I do, now I will not have as much to worry about. What do you do to backup your computer?